When starting a new game in Fire Emblem: Awakening, the player is presented with two sets of options to determine how challenging the game will be. The first is a choice of overall difficulty which includes Normal, Hard, Lunatic and Lunatic+ (if unlocked). Normal is described as “for series beginners,” hard is “for experienced players,” and Lunatic is “for expert players.” The second choice is game mode, with the choices being Classic and Casual. In Classic mode, characters that fall in battle die permanently (permadeath), whereas in Casual mode, the units flee when they are too injured, and will be available again in the next battle and throughout the story. As a veteran of strategy RPGs and of the Fire Emblem series, I felt pretty comfortable selecting Hard and Classic for my difficulty settings. The Fire Emblem series has always been challenging, and in the past, the Casual option wasn’t even available, so it seemed like Hard/Classic would be a perfect combination for me. No. No, it wasn’t. I got completely brick-walled in Chapter 5. Now, before you say, “You’re bad, learn to play,” let me explain. First of all, when I play a Fire Emblem game, a character dying is the equivalent of a “Game Over” screen. I reset the game and attempt the battle again. Usually, after a few attempts, I will have learned enough about the battle to achieve victory without losing a single unit. In this case, however, I was making no progress whatsoever. Characters were dying left and right. With that being the case, I searched for methods with which to grind and strengthen my characters before attempting the battle again, but found my options severely limited. The game does provide several opportunities in this regard, but few of them are feasible for proper grinding so early in the game. There is an item you can buy called a Reeking Box which will generate a challenge battle at the point of the world map in which you use it. If you use it on the site of the Chapter 1 battle, the enemies will be low in level, and it could provide a good way to train, in theory. The problem is the Reeking Box costs 4800 gold pieces (on Hard difficulty), which at Chapter 5 is basically ALL of your money, assuming you haven’t already purchased anything. In my case, I had, so I couldn’t buy one. Challenge battles also randomly appear every so often as you progress through the game, but my luck was bad, and the only one that appeared was filled with enemies that were twice my level. Even my most defense-based and well equipped character could not survive more than two hits from those enemies. Another way to fit in some training is though the Bonus Teams option in the Bonus Box (a collection of bonus features delivered via SpotPass). The Bonus Teams are phantoms of legendary heroes from older Fire Emblem games, and you can view their stats, buy items from them, and recruit them by spending gold or attempting to defeat their team in combat. But once again, so early in the game, I found little hope of surviving any of these battles without losing a unit. As a last resort, I found one more potential avenue for grinding. 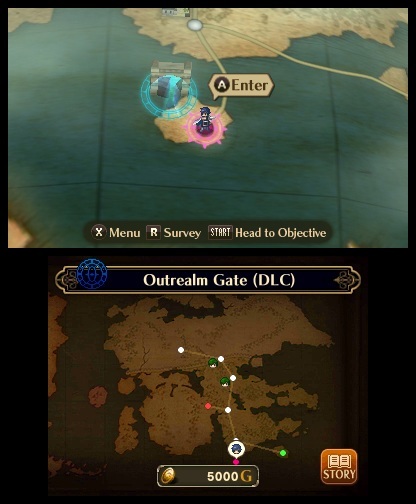 The Outrealm Gate allows you to “visit other worlds.” In other words, this is where you will find all of the DLC that is available in Fire Emblem: Awakening. The unique thing about the DLC battles is that they are repeatable, without any limitation. Finally! A way to train my army! And there is one free downloadable map available. Even better! …oh wait, I’m dead again. Well, it was worth a try. After a few attempts, I did manage to survive that DLC battle, but it proved to be an excruciatingly slow method of grinding, especially considering how often I had to reset the game after losing a character. Finally, after reaching the limits of my patience, I started a new game on Casual. Ugh! Did they have to call it that? While playing on Casual (still set to Hard) I noticed a couple of other factors that may have contributed towards my failure in Classic mode. First of all, I completely missed out on recruiting the character with the strongest defense in that part of the game, so I never really got my tank to control the front lines. I really didn’t see him, so he never joined me. Oops. Second, through extraordinary bad luck, my characters were growing very slowly as they gained levels. Fire Emblem: Awakening randomizes the attribute increases each time a character gains a level. Usually 3 to 5 attributes will be improved, but occasionally only a single attribute will gain a point. This can be absolutely crippling, and of course, my characters ended up underdeveloped. I’m now on Chapter 13 of my Hard/Casual playthrough, and things have become pathetically easy. I have had great luck with growing my characters and have had plenty of challenge battles to grind with. And yet, it’s also incredibly obvious how punishingly difficult this part of the game would be if I was still playing on Classic mode. The maps are getting bigger and are filled with more and more increasingly powerful enemies. I’m glad I made the switch to Casual. And yet I’m also frustrated that I had to. The Normal difficulty in Fire Emblem: Awakening is far too easy, even with the permadeath of Classic mode. For a Fire Emblem veteran, playing with permadeath is part of the experience. Some might say that it isn’t Fire Emblem without it. But sadly, the Hard difficulty recommended for those veterans can be made too difficult by a combination of unlucky factors and a lack of feasible options for grinding. It seems like there is a missing difficulty setting somewhere between Normal and Hard that would provide a perfect difficulty curve for Classic mode. Okay, now you can say it. “You’re bad, learn to play.” I know… I know. It’s still having distribution issues. Remember that the eShop has an infinite number of copies available now. I had the same trouble, except with chapter 6. Hard/Classic was easy up to 5, I had to think on that battle but i pulled through on my second try (if it weren’t for Marth’s high crit rate, it would’ve been the first), starting by rushing my team to the bottom right corner and fighting aggressively to whatever comes close, rather than defensively. The hammer you get from chapter 4 comes handy against the two knights (Use Vaike). Chapter 6, no matter how i played, I could never get through without a death. I ended up restarting lower too. I found the early part of Hard punishing until I accepted using Frederick in the challenge battles as more than a meat shield, letting him lance things while other characters clean up for kill XP, or using him to pair up with a weaker person who needs the defense. Once I did that, I breezed through four of the challenge battles and recruited my villager fairly easily, and I’m just now entering Chapter 4. My real problem is I’m afraid I’ll run out of weapons, so I need to balance my challenge missions with progress for money. Lunatic, I think, will be a bigger eye opener on the value of Frederick early game. I disagree completely, If you ask me “Hard” mode was way to easy. And yes, I am of course playing on classic. I know that Ari was thinking maybe if he had Kellam on his first Hard playthrough that it might’ve made it easier for him. Did you use him at all and, if that’s the case, was he even a factor in making your playthrough easier? 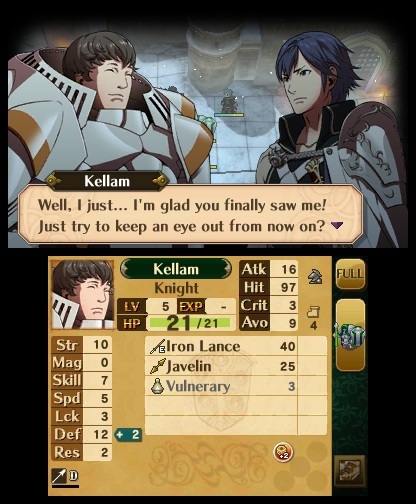 Yeah, absolutely, Kellam would have been huge (no pun intended). In retrospect, I can’t believe I missed him. On my next playthrough, I didn’t miss a single character in the entire game! But even with Kellam, I found myself losing units and glad I was playing on Casual as I got further into the game. I wasn’t trying as hard for perfection since I knew permadeath was off, but it was still clear to me how challenging it would have been to get through the whole game without losing a single character on Classic mode. The people playing on Lunatic and Lunatic+ must be amazingly good at this game! Don’t even feel like you’re wrong. I really think a lot of these “learn how to play it’s even worse on insane” are either masochists or liars. I personally play games to have fun, and a little challenge helps, but this is absolutely nutz. But abusing Risen challenges and Spotpass makes this game too easy =(. MU/Chrom to kill everyone seems to work lol. Sent a lv 1 MU/Chrom alone into ch 11 hard and won lol. The DLC EXP..something and Regalia something are the 2 maps I play when I have 5 minutes to grind. Those are what provide the grinding this game needs. I have over 100k of the money units easily obtained, and on Chapter 12 or 13 (I forget which I’m on) these battles are easy. I bought a lot of weapons and have a lot of different classes since I can buy the seals whenever they appear. It really kind of made everything a little too easy but on Classic/Hard it has been a great experience! And I’ve never played Fire Emblem before. Unfortunately, no, not without starting a new game. I agree that there is one difficulty missing, but in my opinion it’s between hard and lunatic. I had the same problem that “hard” gets ridiculously easy after a while, so I tried lunatic – which actually lived up to its name. The first five missions are ridiculously hard (literally: I sometimes really had to chuckle when seeing the opponents’ stats). It basically stays that way unless you choose to buy DLC to level – which in my opinion is cheating. What you cannot do is normal grinding, since the random enemies are actually orders of magnitude stronger than those you encounter in missions. Either the lunatic mode is simply a tool for selling DLC or the developers really dropped the ball here.